– Why is the measure of love loss? Jeanette Winterson, from Written on the Body. Things are already speculative, provisional. The place is / was on a threshold; estuarine of course, but that’s only the start. Between ages of itself, phases of being. In transition, from its multiple previous incarnations, as historic settlement, trawling village, version of a port, a Victorian resort (of sorts) and now – in at least an aspect, a leading one – a metropolitan extension, an urbane mood without the urban for city-fleeing weekenders who, from their weekday working towers of chrome and glass, long for salt in the hair and distressed wood, from towers where even the air is conditioned and the reverie of breeze – tidally inflected, stars of sun on lapping water – remains merely that, a dream. Open water but not. Defined by capital, the capital. An outreach project. And yet, in all of this fashionable, financial flux, itself; recognisably itself. Peter Cushing, after loss, after his beloved wife; on a bench by the coastal path, staring, day after day, looking so long, willing himself perhaps to become the distance he gazed on, and so to disappearance. We become our loved and so we become our loss. Come once the body of the industry has gone, gutted. Elegies everywhere, like oyster shells, scattered. But still it is, and still, recognisably a place, space with character, and grounded, rooted. It belongs somewhere. So we went too, out of Hackney heading east; follow the river and stop on the shingle. Go for the light and the shellfish, for the ebb and flow of days, older patterns. Be, and become something else, briefly. Calmer. Never quite at ease, military style or otherwise, but something not so tightly wound that one turn more might break it. Normally I’d resist all purchases beyond the local pleasures of seafood and certain ales or wines. Maybe a postcard; pin it up later, some kind of talisman, a trace memory, a view, if lucky, from a window one had borrowed for a night or two. ‘Everything becomes a postcard in the end’, says Don DeLillo. So much rubbish waiting for our money. But maybe something this time, something appropriate with age. Suitably weathered. Books – things in and of time – it always comes back to books. I am rarely drawn to objects, but paper… this ghost timber, this sense of walking through the forest of words… Actual and unseen burdens, the weight of endless boxes, in the move between temporary properties that seem, when stacked, to be made of the books they house, room space expanding and contracting (and finally always opening out into all the visions of the heads that wrote) with the density of volumes (it can’t be any chance that a Kindle is so called; what’s used to set the bonfire of the books…). Now this will to purchase papered texts seems like the building of a dam against the pixel flood. Just off the waterfront, one street back and at the fork, tucked into shade, the kind of shop that is so hard to find, and ever more so now, only a decade later, in these all too conscious days; aware of its stock but not so savvy – or even bothered – that it checks online with every sale, making sure it hasn’t missed a gem, a virtual under-pricing; a second-hand shop on the cusp, between its stock and salvage. Near the door, on a trunk, modest, inconspicuous, as though they’ve just been put down for a minute, while someone sorts the shelves: a clutch of photo albums, a job lot, a memory lot, in the old style, heavy, black, cloth-bound, pages thick, and slightly buckled when the sheaves are full, a little like warped wood, like wood in rain for years and years and years. I sit down next to them and look; maybe half a dozen. Flick the pages, families in Wales and by the sea; the early years of the old century, pre-Millennial; people in neat, small gardens, weddings, promenading, waving, on holiday, at home; people, like strange fish, who can only breathe in the past. And then, one left to browse through, idling minutes really, before the next indulgence, one left, the slimmest, A4 landscape format, screw-bound fastened, no spine, just these maybe 30 pages secured between the boards, as if the whole collection was not a finished album, even when it only was a virgin product, let alone a gallery, as if it could swell or shrink dependent on the need and the length of available screws. I open it. On the first page, there are four photographs. Two each of two men, separate, seated. In high-ceilinged bourgeois rooms – paintings, ornaments, a model aeroplane hanging from the ceiling – both are relaxed, sitting back; the older man, pipe smoking, maybe 45, staring into the lens; the younger, 22, looking off. Hand-written titling for the page declares: Alfonso and Robert, F8 Viscaya, Nov 1933. And so, the facts: the album is constructed, and not only as all are, with pictures positioned and labelled. It is conscious; and male. It begins in its present of making and runs in reverse (that is, it has been assembled after the event ); or rather, from its now towards an origin, towards the earliest of its evidence, into its own oldest past, 1909, and another age entirely. The images are small, black and white, of course; corner mounted, never more than six to a page, often less; and in remarkably good condition. With only a handful of exceptions, the sequence remains in its established order (occasionally a tango step or two back and forth between years). Most spreads or series are labelled with time, place and forms of naming. In this, the spectrum of chronology apart, it is conventional. What it shows is, well… at the back, the earliest pictures are literally – and suitably – sepia-tinted. College photographs, young men with surnames on steps and playing fields. An incongruous page of baby-carriage snaps, unscripted. And then the men are seen again, the youthful suits now gone, replaced with uniforms, barracks shot, officers’ quarters, tents, several comedic poses, occasional leave locations, women in group portraits looking anxious, and men also visibly tense before the box photographer. And then a page of Somme-like dereliction. Bombed out churches, Christ trees bare as bone along the crest, the image surface edging out to white. Afterwards: the mess at Camiers 1919 ; survivors, greatcoats and women in white headscarves beside a snow-pale road. This is the world before; the old world; 10 pages or so. What follows; 13 years clear of the camera. But in that time, an ocean’s navigation, a journey into heat, and Mexico. Boys again, late teens, physical education students at the Colegio Williams; class portraits, and interiors, and excursions across the country, to the mountains, to the sea, Taxco, Acapulco, San Miguel Regla, Nevada de Toluca, Bellavista; friends informally together, holiday cottages, boot boys and houseboys, the road to El Chico; a melée of shots from 1932 to 1934. A life so far from European straits, from formal clothes and poses, the stresses of the war. A life lived by a man called Self, by now maybe 40, an Englishman entirely in his class, clean shaven, tall, with hair receding, in shirt and tie outside his house, standing confident, himself. Half a dozen images of him. Alfonso in cricket whites and rugby shorts, with cats and bicycle and swimming, in bedrooms sitting, waiting, and smooth against a wall; by the car in alpine snow, lying on chaises longues, on all the travels, known to all these places; pages where it’s only him, and one page where there is a single portrait only, his gazing straight into the camera, wary, slightly, vulnerable, open necked, mid-1933. And so, the speculation; which is hardly that, of course, when all is weighed. A teacher and a student, the humid freedoms of a zone beyond the empire map, colonial (regardless of the nations), the two-way promises of wealth and flesh and who knows how much love, for surely there’s affection here, these are photographs of continuous looking, a developing bond, mapping the hues of the gazed upon. For how long, who can say? And beyond the opening page, forwards, towards us… the bright, lost lives within the album slipping into times no longer held by any means or form; becoming what they always and anyway are, unknown, and now completely gone. What else are photographs but images of what they, we didn’t see? The negative space around the image is the first omitted element, but even the presence is tense with all that can’t be carried over. Light artist James Turrell is renowned for his sky view portals, apertures that hold the clouds, a frame around the day, that’s all. But frames allow, enable the human need for stories. Once a frame is there, things are in or out. Choices can and have been made. And so a narrative begins. The album is the personal frame par excellence, and on all the obvious levels, from the choice of subject, mood and moment to sequence, size and overall selection. But oh, the life outside the album’s cell. There the living’s done. Surely photographs are grief emulsion, shards of raw experience torn from their pitch and flow, spirit thefts (we know) and site thefts, fragments of their place, rich threads of the weave. This is how the world unravels. In Laura Mulvey’s thesis – for cinema – it is death that is caught 24 times / frames per second, not life. In certain folk tales, the ‘death’ of a character is not found or carried in the body, but in another object, exterior and elsewhere (an egg in a tree, a box in a tower etc.). Destroy that avatar and the life is taken. This remains true in many material ways. Death can grow from within a person and spread; or it can come from outside, in the form of a car, a blast, a bullet, a plummeting plane. An album serves in a way to remind us of this fact. By creating a vessel of our selective, chosen life onto pages, we are securing its inverse, its passing, there too. All albums are books of remembrance in the mortal sense, even while their maker is breathing, dispatches from the kingdom of the (soon to be) dead. A visitors’ book for the earth, signed in half-fixed smiles, unsteady lips already trembling somewhere else, then closed. Photographs of absence, not of presence, regardless of the people in the shot. Is this because, at base, at source, an album is, due to its dependence on the (soon to be) dead, finally a forgetting project; with memory a burden, and this burden seeking dispersal, a passing out of the head onto the page, to be held there as if in amber for a period, and then, inevitably, following its subjects to the place beyond all lights. Despite the proximity of the images in this strange collection of threshold moments, recognisable scenes of universal human business, it is as if they might have come from the perspective of the early aerial shots of pioneering Parisian balloonist photographer Nadar, another subject of Barnes’s book Levels of Life, rising into the air over the city to show something that had never been seen before. All change. From above, everything is different and all the hurt, all the joy is gone to naked eyes, only figures moving like ants across a yard, or rain across a pane. Flying above it all, and at some point, maybe, freefall; flying become falling. We can never know another human being. The Japanese Zen garden of Ryōan-Ji is designed specifically so that not all of its features can be viewed from a single point. It’s strange because, when I first acquired the album, beyond the otherness of the people featured – their actual lives and the evidence of their times, even if the currency of their moment seemed accessible – I felt nothing like the pressure of the terminal that I have done recently, examining it again closely for this piece. I am older, yes, and my son has been born since I bought it, the surest measure of the finite span. But something else seems to invest this encounter with its constellation of elegy. 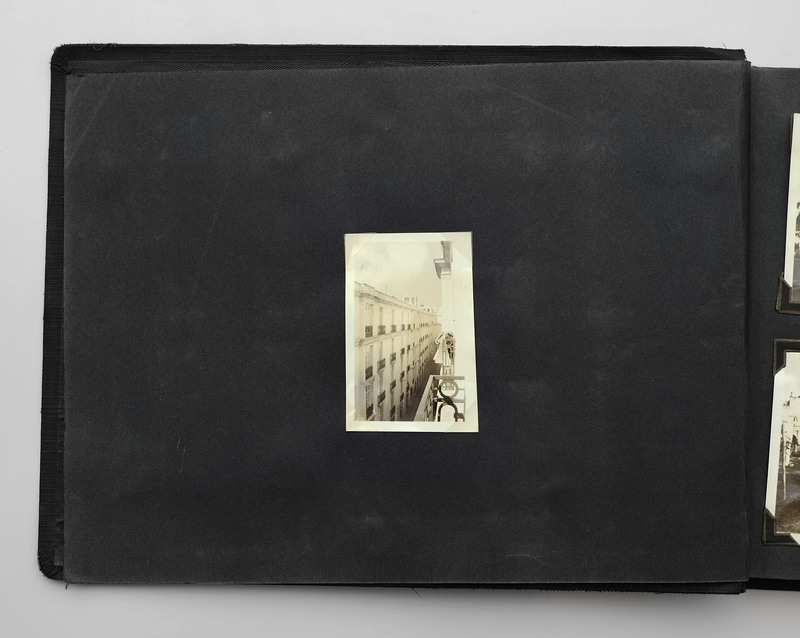 There is one image, on its own on its black sheet (on the reverse of the very first page), taken from what looks like a fourth floor apartment or hotel room balcony on a residential avenue, a tight diagonal shot down the shadowed street. There is nobody in the picture. It is a bright day. On the next railing along, there is something like a towel or blanket. Placed centrally, this picture appears always to have been alone. There is no trace of the imprint of lost pictures or mounts. It stopped me in my tracks when I first saw it, and it still does. It feels unquestionably, despite the many surprises of the collection entire, and its broad, dramatic sweep as described above, like the hinge to the entire album. On this balcony, in this room, here, something happened. Something happened; finally, the only sure description of all our fleeting lives. We all have a balcony moment in our own experience, a key, sometimes only turned into awareness after the fact, when a door opens and a threshold appears, and there is a before and an after, and a frame and a choice. Gareth Evans is a writer, curator, editor of the journal Artesian, publisher of Go Together Press and works as the Film Curator of London’s Whitechapel Gallery. He programmes PLACE, the annual cross-platform festival at Aldeburgh Music in Suffolk and produced the essay film Patience (After Sebald) by Grant Gee. Posted on May 2, 2013 December 8, 2016 by vsmallfires	This entry was tagged Jeanette Winterson, Julian Barnes, Mexico, Nadar, Whitstable. Bookmark the permalink.